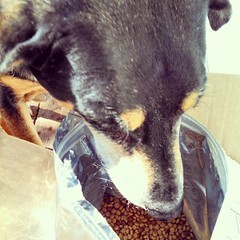 Thank you to everyone who entered to win a bag of Petbrosia custom dog food! The winner has been chosen by random number generator. Congrats to... the Retro Rover pack! We can't wait to hear how Ping likes it! As for the rest of you, stay tuned... we are currently testing out some more great products to tell you about soon! Oh The Horror... and Embarrassment! Giant Scissors Meet Bulldog Lawn Ornament?